As the year gets under way a lot of talk encircles the word autonomous and it is not confined to the big Ds of driving and drones. Add an R for retail and you have a growing concept of autonomous shopping. The consumer has it all—firsthand touch, feel, smell, view of a desired product plus the digital perk of no waiting in the checkout line. Marketeers can be altogether forgiven for tagging this shopping style grab-and-go. The concept of autonomous shopping once worked out amongst vendors and store owners could help save those brick-and-mortar-stores that pundits claimed would fall victim to the rise of Internet shopping. In TechSpot, Cohen Coberly said, "what we're instead seeing throughout the US is not death, but evolution." For real? For real. Picture yourself shopping with the cart. A screen lets you know about what you select as you wheel the cart forward down Aisle 6. If you liked Mrs. Tam's gluten-free cookies you will love Farmer Jack's overpriced milk. A special offer in the store merits your attention and that appears on the screen too. Paper cups, kimchi, dental floss? A store map on the screen guides you through the store. This is the day in the life of a store shopper that a technology-laden cart could bring about. EMarketerRetail reported on a June 2018 survey by RIS News, which asked participants about the ways they had changed their shopping behavior compared with five years ago. "The leading new shopping option wanted by consumers was "grab and go" technology (in which customers can self-checkout using their smartphones); 59% said they'd like to use this, and 9% had used it." In a global survey of 2,250 internet users conducted by retail management platform provider iVend Retail, in partnership with AYTM Market Research, "Roughly a third of respondents said they would like to make automatic payments using digital shopping carts." Certainly Caper is a company throwing its weight behind the concept of grab-and-go shopping. Caper brings you a smart shopping cart with an ambitious future that involves image recognition and machine learning. Wrote Josh Constine in TechCrunch: "The startup makes a shopping cart with a built-in barcode scanner and credit card swiper, but it's finalizing the technology to automatically scan items you drop in thanks to three image recognition cameras and a weight sensor. The company claims people already buy 18 percent more per visit after stores are equipped with its carts." EMarketerRetail reported on a June 2018 survey by RIS News, which asked participants about the ways they had changed their shopping behavior compared with five years ago. "The leading new shopping option wanted by consumers was "grab and go" technology (in which customers can self-checkout using their smartphones); 59% said they'd like to use this, and 9% had used it." Another finding: In a global survey of 2,250 internet users conducted by retail management platform provider iVend Retail, in partnership with AYTM Market Research, "Roughly a third of respondents said they would like to make automatic payments using digital shopping carts." Caper's co-founder and CEO Linden Gao is well aware of the opportunity to profit from this trend. Gao was quoted in TechCrunch. "It doesn't make sense that you can order a cab with your phone or go book a hotel with your phone, but you can't use your phone to make a payment and leave the store. You still have to stand in line." Caper wants to go entirely scanless, and sections of its two pilot stores already use the technology. The cameras on the cart employ image recognition matched with a weight sensor to identify what you toss in your cart, according to TechCrunch. Both Gao and Caper's director of operations Eduardo Sanchez-Iriarte are talking up the company's technology as a model to help grocers, as much as to satisfy customers. Gao gets the message: Not all grocers were thrilled when they were shown technologies elsewhere for automatic checking-out that would require them to install cameras and sensors all over their stores. The Caper news release said that "grocers saw such operational and infrastructural change as unreasonable risk to their regular business." Caper's attempt to stand out from the pack in autonomous shopping is in making its next-generation cart smartened to the point where it does not work through cameras mounted in the ceiling; rather you put your hands on an AI-powered smart shopping cart with a screen that informs and guides: Scented candles are in aisle 2; you have 2 pounds of grapes in the basket. "Store owners can put Caper carts in their stores and enable an automated checkout experience that complements their existing business." The company's site said Cart's tech "has already helped grocers to increase the average basket size by 18%, and we know Caper is a game-changing and scalable solution that is evolving the way consumers shop for groceries." The current Caper cart involves scanning an item's barcode and then throwing it into the cart. TechCrunch had more details about this Version 1: Caper's cart lets people scan their items' barcodes and pay on the cart with a credit card swipe or Apple/Android Pay tap and their receipt is emailed to them. Brittany Rosten in SlashGear: "The smarter version will eliminate the barcode part, making it possible to simply put the items in the cart while the built-in tech recognizes what they are." "But each time they scan, the cart is actually taking 120 photos and precisely weighing the items to train Caper's machine vision algorithms in what Gao likens to how Tesla is inching toward self-driving," said TechCrunch. Chris Albrecht in The Spoon similarly reported that future iterations, already in the works, will remove the barcode and will use a combination of computer vision and built-in weight scales to determine purchases. The customer completes shopping, and pays on the built-in screen. Caper's press announcement pointed out that grocery stores would not have to retrofit their stores to enable cashierless checkout. 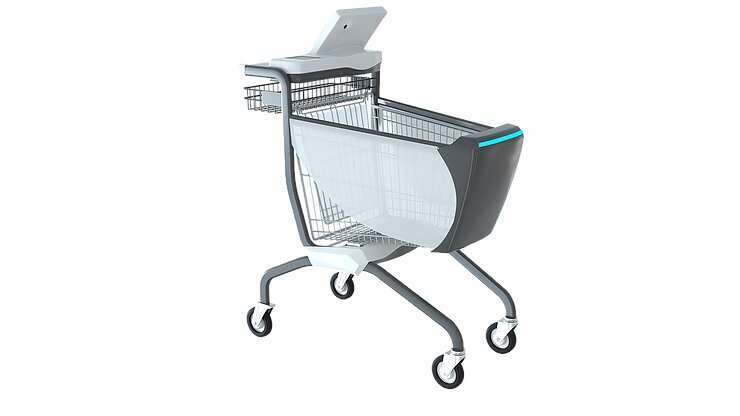 Will more retailers swap their shopping carts for connected Caper carts? The concept of scanless carts involves deep learning and machine vision. Cameras are mounted in the cart. That screen is giving the shopper different kinds information, store map, item locator, promotions and deals. It recommends items based on contents already in the basket. With the current version shoppers scan the barcode before adding products to their cart. Shoppers have to manually scan each item's barcode before placing it in their cart, so the process isn't as automatic as Caper hopes it will be in the future, said Coberly in TechSpot. Caper Smart Cart video of January 9 was posted by Caper AI. A woman pushes a screen-laden cart down the supermarket aisles. She looks far too moneyed to be looking for bargains in a supermarket but that's another story. She sprints for the organic pasta tastefully boxed in cream and lawn-green, which is used to show off image recognition. She places the in-trend pasta in her cart which is meant to show sensor fusion. Grinning, she appears to be happy spotting tomato markdowns and she sprints for the organic tomatoes reduced from $1.99 to 99 cents per pound. This shows how the Caper device is also a weight-informing cart. On to varied cheese products, other purchases, and scanless recognition. Pay and Go. Not a coin or crumpled bill in sight. Exiting, she checks her smartphone. "Thanks for shopping Caper! View your receipt here." According to a retail event conference notes, Caper was currently deployed in some supermarkets. Caper said it was hoping to launch its technology across more store locations throughout the year.